One would have thought that after almost one month spent entirely by hiking in Chilean Patagonia, we should have enough of any physical activity and that we wouldn't be willing to see another glacier, river, or a thousandth mountain. But the very opposite was true. Patagonian nature can be addictive, and we definitely did not want to miss the most famous Chilean national park, Torres del Paine, especially when we consider that there is a big chance we will never visit this part of the world again. In the past few years, Torres del Paine became a mecca for avid hikers and mountaineers from around the world, but the park is more and more visited by local travelers as well. The popularity increased prices and also the simple rules were replaced by the more strict and complicated ones. Even us, who are used to look for information about places on a daily basis, were confused and couldn't imagine how we will handle our travels and hiking in Torres del Paine. 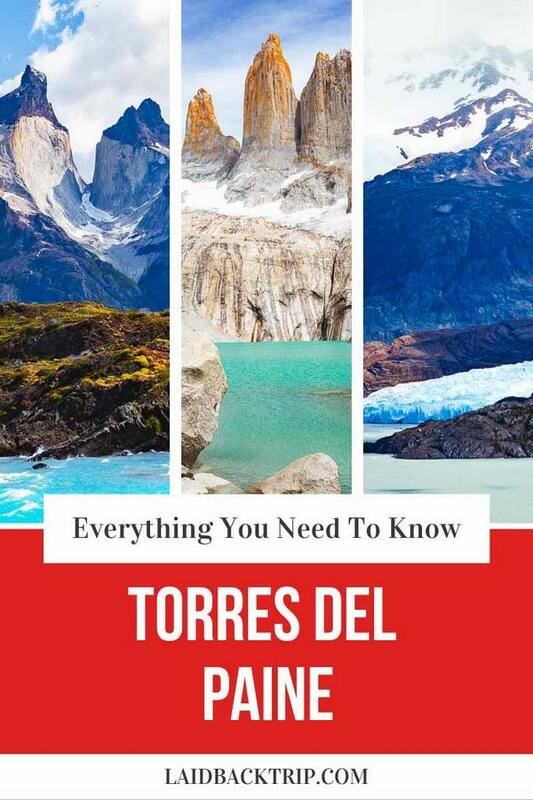 That's why we've created this guide aiming to provide you with useful information you need to know before visiting the natural gem of Chile and overall of entire Patagonia. Although Torres del Paine is the most famous national park in Chile, it doesn't mean that it is either easy or cheap to reach it. Quite the opposite, but the natural beauty is so overwhelming that many people are willing to undergo the long journey or spend some cash to witness all the park's features. Torres del Paine lies in the southern part of Chile, in the region of Magallanes and Chilean Antarctica, close to borders with Argentina, but because it is disconnected from the Chilean mainland by a network of deep fjords, there are several ways how to get there, but none of them include overland access via Chile. Nowadays, Torres del Paine is easily accessible by car or public transport, but first, you must get to Puerto Natales, the closest city which serves as a base for travelers before and after exploring the park. Plane | The most efficient, but also the most expensive way how to get to Puerto Natales is to travel by plane. Although Puerto Natales has an airport, it normally serves only direct flights from and to El Calafate, Argentina, so your best bet is to buy a flight ticket to Punta Arenas and then take one of the frequent buses to Puerto Natales. If you came to visit Chile only for a short time, flying is definitely the best way how to get to Torres del Paine instead of spending tens of hours on the bus. Public transport or car | When traveling in Chile by bus or by rental car, in order to get to Torres del Paine, you need to cross borders to Argentina first. It doesn't matter if you travel Carretera Austral where you can cross borders in Chile Chico or if you are coming to the south from the central part of Chile (you can cross borders at Paso Cardenal Antonio Samore which connects destinations Puerto Varas in Chile and Bariloche in Argentina), there is no other possibility. Even though it sounds complicated to travel via another country, it is actually straightforward, and it gives you an opportunity to visit some of the most beautiful places in Argentinian Patagonia: El Chalten, Argentinian hiking capital famous for Fitz Roy and El Calafate, a small town close to one of the South America's biggest glaciers, Perito Moreno. Ferry | Puerto Natales, as you can tell from the name is a port, so it raises the question if you don't want to experience a bit more adventurous way how to reach Puerto Natales. You can travel to Puerto Natales from Puerto Montt, the beginning of Carretera Austral. Be ready that the journey takes three days, but it again offers a unique Patagonian experience. If you plan on getting to Villa O'Higgins, the end of Carretera Austral, you can travel to Puerto Natales from nearby Puerto Yungay the sailing take a bit less than two days. When you got to Puerto Natales, traveling to Torres del Paine won't be difficult. There is a paved road between Puerto Natales and the park, and the quickest option how to get there is by car - it will also give you freedom as you won't be dependent on a bus schedule. But even without a car, there are no difficulties to reach the park. Several bus companies run daily services to the park (at least during high summer season), the only thing you must do is to buy a ticket one day in advance on the bus terminal or your hostel should help you with that as well. When we arrived in Puerto Natales and saw the number of travelers, we were worried that there wouldn't be any seat left on the bus the next day, but apparently, when one bus is full, the company dispatch another one. From what we saw, all the buses looked the same, they had similar schedules, and the service offered was the same too. The roundtrip open ticket cost between CLP 10 000 - 15 000 (we paid CLP 13 000, but the guy in our accommodation told us he would have been able to arrange it for us cheaper) and first buses to the park leave at 7 AM, then at 8 AM and at 2:30 PM. To get from Torres del Paine, take a bus (with the same company) at 2:30 PM or at 7 PM. The ride from Puerto Natales to the park's entrance and the trailhead to the Towers take 1.5 hours, when going to Grey Glacier, add another 45 minutes. When traveling to the national park, you might wonder where to get off from the bus, but no worry, it is easy. The first stop is in Laguna Amarga. It is where the visitor's center is, where you need to buy or show your ticket, and where the most famous one-day hike to the Towers starts (you have to take another bus to get to the actual trailhead). You can also get off here in case you want to hike multi-day W trek in the opposite direction than the most of hikers, but you have to start your O hike here as it can be done only counterclockwise. The next stop, approximately another 30 minutes by bus is Pudeto. From here you can make a short but rewarding hike to a waterfall Salto Grande, but most likely you will arrive here to take a boat across Pehoe Lake to start your W hike or as we did, a one-day trek to Grey Glacier. The last stop on the bus route is at the park's administration office called simply Administracion. Not many hikers get off here usually only those willing to hike the most ambitious trek off all in Torres del Paine, Q trek. We found the entrance fee to Torres del Paine very expensive, especially when we were able to hike in Pumalin National Park, admire Laguna Cerro Castillo or explore Patagonia National Park entirely for free. When we compare all those places, we did not find Torres del Paine that special to pay CLP 21 000 (this price is valid for foreigners locals pay only CLP 6 000), and maybe because of that, the most popular trek in the park leading to the viewpoint of Torres seemed a bit overrated and overhyped to us. Once you pay the entrance fee, you are allowed to hike multi-day treks in the park (so the admission is not that steep when you spend more days in the park), but you must pay the same even for a one day visit. If you're not planning on staying in the park, but want to do several one-day hikes, you can enter the park in three consecutive days with no additional cost. It is important to have your passport with you (a copy or screenshot on your phone will work as well) for registration. You can pay your entrance fee by the park's entrance where they accept cash only, or you can buy it in advance on the main bus terminal in Puerto Natales and pay by credit card (no cash), but it won't give you any advantage as you will have to queue in the line anyway. Weather in Patagonia and Torres del Paine is unpredictable, and you should check the weather forecast only one or two days before your hike, but still don't ever completely rely on it. Although summer is considered to be the best time to visit Torres del Paine, it doesn't mean that you'll be guaranteed with clear skies all the time. Rather the opposite. Yes, temperatures in the summer months from December to February are in their highest, and it is a perfect time for hiking, but those months receive quite a lot of rain, and the wind is the strongest. Haven't we mentioned the wind yet? We were quite surprised by the strong winds in Torres del Paine it was unquestionably the hardest thing we had to deal with when hiking. Wind gusts commonly reach up 110 kilometers per hour! Still, we would again choose to visit Torres del Paine in summer as the weather is more stable than in the rest of the year (February is the best), days are long, the only downside is the number of visitors. A good option might be late spring or early autumn (March, April, September, October) when you can skip the crowds, and you can also get lucky with the weather, although be prepared for lower temperatures, especially when you decide on camping. During winter the winds cease, but temperatures are low, and there's plenty of snow in the park (you can also get caught in a snowstorm), so it is not advisable to do the hiking unless you are well-experienced. Staying in Torres del Paine in the hotel doesn't come cheap, but it is a great experience to wake up in the middle of one of the world's most beautiful parks, plus after a long and tiring day of exploring Torres del Paine, you won't need to jump on the bus or travel by car back to Puerto Natales, but will have the unique possibility to stay and relax instead. You can also treat yourself in one of those hotels after you finish one of the multi-day hikes. Among the most luxurious hotels in Torres del Paine where you can spend a night or more belong Hotel Lago Grey or Hotel Las Torres Patagonia. Slightly more budget-friendly option is Konkashken Lodge or Vista Al Paine. Rooms fill up quickly in the high season, so do not forget to make a reservation well ahead. Once in the park, you can stay in the campgrounds or refugios managed by three different companies, those places are cheaper than a hotel (but not that cheap when you take into account you'll be staying in a dormitory or in a tent), and are usually used by multi-day hikers or those who want to do multiple day hikes and don't want to return every day to Puerto Natales. Be aware that capacities at the campgrounds or in refugios tend to fill up even quicker than hotels in Torres del Paine. Torres del Paine is the best known for several multi-day treks, with strange names - W, O, and Q. All the names refer to the shape of the treks when looking on the map. The most iconic hike of all is the four to five day long W trek which will take you through the true Patagonian landscape and ends (or starts) by the lake with views overlooking the Towers. At first, we were planning on doing this hike as well, but because we traveled in South America for longer and did not have a set itinerary, we did not know when we would be in Torres del Paine and were not able to make a reservation ahead of time. This is the W's biggest disadvantage. It became so popular that you must make campground's reservation long in advance as it is very often sold out when quotas open. Our disappointment from not hiking W wore off soon once we saw how many people are hiking the trail and also, to be honest, we were not that amazed by the park's main feature, the Torres. It might had something to do with the fact that after one month of traveling in Patagonia, we saw quite a lot of beautiful landmarks such as Marble Caves in Puerto Rio Tranquilo or Hanging Glacier in Queulat National Park which we liked more. Another two hikes, O and Q are longer (8 - 10 days) and don't see that many visitors, but eventually join the W trek. But if you'll decide to hike one of those treks, we believe you will enjoy it. Do not forget to book tent sites or dormitories on time, be prepared to carry all your stuff (although you can book a site with a tent already pitched, and the meals can be cooked for you in refugios), find all information about when to hike (O and Q trails are open only from November till the end of March), and what are the trails' conditions and set off! If you were not successful in booking accommodation along one of the multi-day hikes or you just prefer one-day treks, do not despair. There are many of them, but for some, it is required to have own transport or take a boat ride to the beginning. We did two one-day hikes, one to the Mirador Las Torres, but to be completely honest, we liked the second hike to Glacier Grey much more (both hikes are part of W, and you can do one more to the French Valley which will allow you to see the most of W without actually booking anything). To reach the Glacier Grey trail, you must take a boat across Pehoe Lake for CLP 30 000 per person per round trip. When you decide to spend at least one night in the park, your first task is to make a reservation. Camping is the cheapest option how to sleep in the park (one night cost around $8 per person), but to make a booking, you must first select what campground you would like to stay at, and then have a look who is running the campsite as there are three companies in the park managing campgrounds and basic accommodations. It is CONAF, Vertice Patagonia and Fantastico Sur. Once you make the reservation, do not forget to print it out and bring it with you on the hike altogether with your passport. Hiking in Patagonia has its specifics, and you should take them into account when planning on hiking there. Before your visit to Torres del Paine, check the weather forecast, but do not forget that it can change several times a day. When visiting the park for a day, we would never leave Puerto Natales without rain poncho, windproof and waterproof jacket. Wear good sturdy shoes, hiking trousers (we would give up on shorts here), fleece jacket and a functional t-shirt. You don't need that much water as in general water in the park from streams is drinkable, but don't forget a hat and a sunscreen. This is always a tough question. Taking a guide to hike in Torres del Paine depends on your traveling style and on your budget. Although when possible, we always prefer hiking on our own, we completely understand that some people prefer to have everything arranged without looking for necessary information all the time. In case you feel that a tour would be the right option for you, you can click on this link and find the most suitable hike for yourself. Overall, we don't think hiring a guide is necessary in Torres del Paine in case you want to hike the most popular treks as all the trails are well-marked. Most likely, Puerto Natales will be your home for a couple of days, and it does not matter if you'll be coming back here after one-day hikes or you will be preparing yourself for one of the multi-day hikes. Puerto Natales has everything people need when traveling: several nice hotels and hostels, grocery shop, ATM, well-connected bus terminal, clothes shops (in case you forgot something), and restaurants. And where to stay when in Puerto Natales? We have the best picks in each budget category for you. BUDGET | Casa de Familia Puerto Natales - One of the cheapest private rooms you can find in the town includes filling breakfast and good wifi. This property is owned by a local family who will make sure your stay will be comfortable. MID-RANGE | Yaganhouse - Cozy and bright guesthouse has one of the top ratings in Puerto Natales thanks to the friendly atmosphere, great breakfast, and clean rooms. Some of them feature a private bathroom. LUXURY | Hotel Simple Patagonia - Do you want to feel the real Patagonia? Stay in this hotel with amazing views and perfect service.